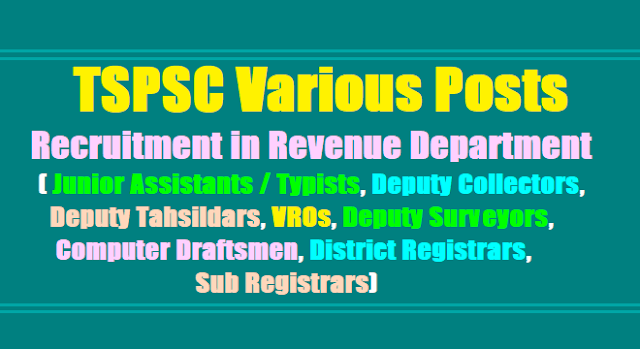 TSPSC to fill 1506 posts in Revenue Department: Junior Assistants / Typists, Deputy Collectors, Deputy Tahsildars, Junior Assistants / Typists, VROs, Deputy Surveyors, Computer Draftsmen, District Registrars, Sub Registrars, Junior Assistants to be filled in TS Revenue Department. VROs, Deputy Surveyors, DTs, Registrars, Junior Assistants / Typists, Deputy Collectors Recruitment schedule to be released by TSPSC. Public Services – Revenue Department - Recruitment – Filling of (1506) One Thousand Five Hundred and Six vacant posts in various categories by Direct Recruitment in Revenue Department, Telangana, Hyderabad, through the Telangana State Public Service Commission, Hyderabad - Orders -Issued. 2.Revenue (Ser.I) Department U.O.No.13214/Ser.I/2017, dt:22.06.2017.
what might be the required qualification?